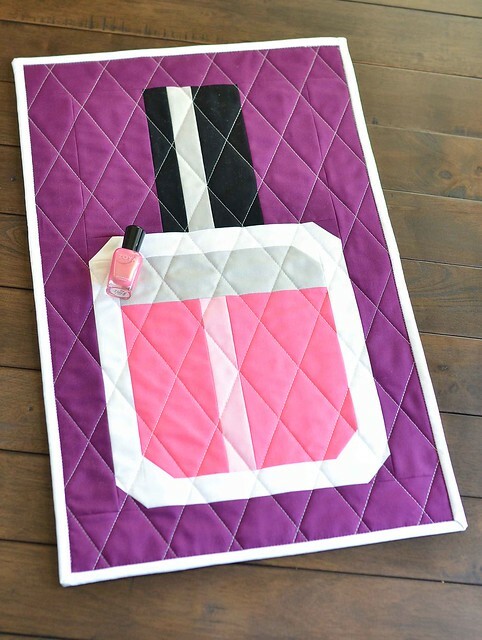 The Fat Quarter Shop recently contacted me about making my own version of their Nail Polish mini quilt. When I saw it I knew that this would be a perfect project to make with my daughter. I let her pick out her favorite nail polish color and then we did our best to match it to a solid. The nail polish is Zoya Happi and the fabric is Kona Camellia. I really hope that my daughter is interested in learning to quilt when she gets a little older so I am always happy to find a project that gets her interested in the process. It helped that this project is super quick because she gets a little impatient with long projects. Finished size: 14.5" x 22.5"
If you would like to make your own nail polish mini, there is a video, a tutorial, and even a kit! How cute. Perfect for anyone who loves polish. Pretty! I like the diamond shape quilting! Gorgeous and love your fabric combo! Very pretty! I love the diamond quilting too! Are there any tips for doing this? It turned out really adorable. I love the purple background!